The inaugural Indiana State University International Music and Culture Festival showcasing artistic traditions, past and present, is set for March 12-15. Arts and culture is a significant vehicle for finding common ground with others and expanding our understanding of the human experience, organizers said. The festival will offer attendees a unique glimpse into current global perspectives. "The International Music and Culture Festival is the culmination of the work a number of us have done towards offering our students an international, multicultural experience," said Brian Kilp, professor in the ISU School of Music. "We have provided our students with immersion experiences in Italy, Austria, Thailand, China, Taiwan, Vietnam, Thailand and now finally have a chance for our friends at partner institutions to bring their students and faculty here. I hope everyone will join us as we share presentations, discussions and performances on the ISU campus!" The festival will include student and faculty participants from partner schools and universities and musicians from five countries: Shenyang Conservatory of Music, China, University of Pécs, Hungary, Mahidol University School of Music and St. Gabriel's School, Thailand, An Giang University, Vietnam and Eun Sun Jung, a Gayageum musician from Korea. Students and faculty from six departments from ISU will be also contributing to the festival, including African American studies; art and design; languages, literatures, and linguistics; textiles, apparel and merchandising; theater; as well as the School of Music. The colleges of education, arts and sciences and technology will be represented. Day and evening performances and events are available. For a complete schedule, go to indstate.edu/cas/music/events/imacf. In collaboration with Arts Illiana, visit the Arts Illiana Gallery, located at 23 North Sixth St., to view the current exhibition "The American Dream" representing interpretations of the American dream from artists across North America including the Wabash Valley. The festival is made possible by support from the Center for Global Engagement, Academic Affairs Office, College of Arts and Sciences and School of Music. 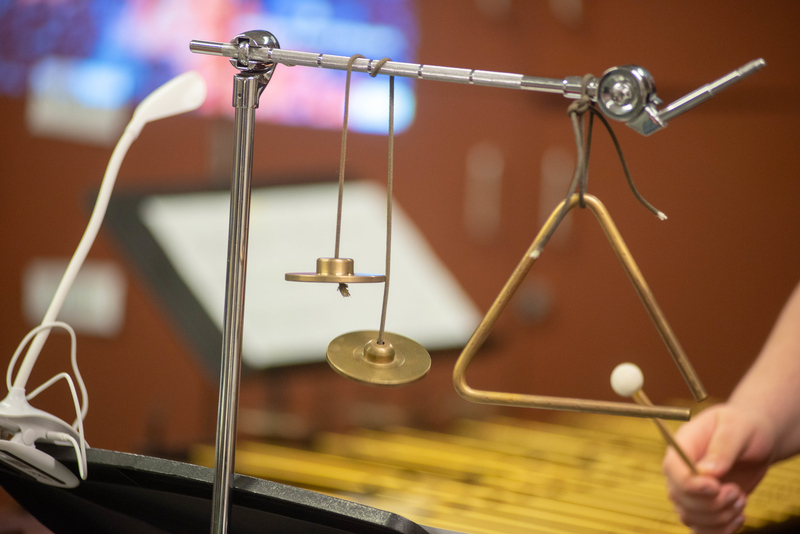 Photos: https://photos.indstate.edu/Events/Events-by-Year/Campus-Wide-Events-2019/Performances-of-Digital-Art-and-Percussion/ -- Indiana State University art and music students rehearse a video and music collaboration. Three art students created a video that is accompanied with music by 10 members of the ISU Percussion Ensemble. The festival will include student and faculty participants from partner schools and universities and musicians from five countries, as well as students and faculty from six departments from ISU.